In 1727, a young man in colonial Philadelphia formed a group of 12 artisans and tradesmen for the purpose of mutual improvement and philosophical debate. They were the entrepreneurs of the day: cobblers, lithographers, blacksmiths, etc. They met every Friday evening and, over time, their discourse-fueled sessions led to experiential activites and initiatives. The most famous one involved the members borrowing books from each other. Over time, those initiatives began to spill into the Philadelphia community and, as they took root there, began to spread across the emerging nation. Today, such American institutions as our volunteer firehouse, public universities, public hospitals, and yes - our public library system - all trace their roots back to these 12 young men and what they initiated. Led by a young Benjamin Franklin, it's an understatement to say that they changed the course of American life. Franklin called this collection of 12 men "the Junto" which means "group" in Latin, one of the many languages that Franklin was believed to be fluent in. Furthermore, he used an alternate name for the group - the Leather Apron Club - since so many of the members literally wore leather aprons as part of their vocation. As a Benjamin Franklin buff, this story was an inspiration to me. Twelve young men had such an impact on American society and changed the course of history. Some of my old friends and colleagues know that, in 2006, I formed a small group of entrepreneurs with the mission of creating peer-to-peer dialogue that could help improve Chicago as an entrepreneurial community. Inspired by Ben Franklin's Junto, I named this new group the "Chicago Junto" and it met regularly for about two years, after which it went dormant. Fast-forward a few years to the period when I was working on what became The Junto Institute. As I wrote recently, I had two friends - David and Jeff - who helped me in the initial research and development period. We were debating different names, none of which garnered a consensus buy-in. One day in March of 2012, we resumed the naming discussion in our West Loop office. David and Jeff were both seated on a couch and I was standing in front of a long whiteboard that had the dozens of names we had brainstormed. It suddenly occurred to me that there may be a name which would be perfect so I decided to tell them the story of Ben Franklin's group...a longer, more detailed version than the one above. I explained who was involved, why he did it, and how much of a lasting effect Ben and his colleagues had on our country. I paused and finished, "Because we believe that this venture is going to have an impact on the people and the companies that go through it, and since it will be a learning organization, I recommend we name it, 'The Junto Institute'." They both literally jumped up and exclaimed "Yes!" as we exchanged high-fives. And that's how The Junto Institute was christened. A little over a year later, Catherine and I agreed that we didn't want to give standard diplomas or certificates to the Junto graduates. 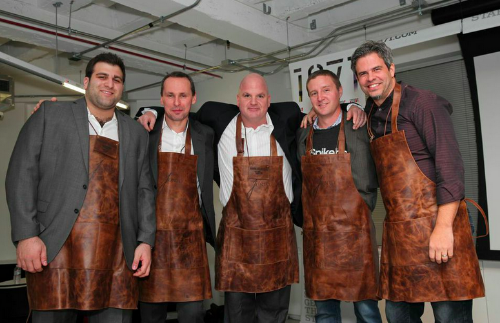 Instead, we decided to give each company a custom-made leather apron. It was an appropriate symbol of the hard work they put into improving themselves under the tutelage of their Mentors and Instuctors: seasoned entrepreneurs and CEOs who are the craftsmen. And once again, we decided to honor Benjamin Franklin's group by naming our alumni organization, "The Leather Apron Club".